Biography: Maria Elisa Soldani (Pisa, 1977) è ricercatrice postdoc presso la IMF-CSIC di Barcellona e membro del progetto di ricerca La Corona de Aragón en el Mediterráneo bajomedieval. Interculturalidad, mediación, integración y transferencias culturales diretto da Roser Salicrú Lluch. Si è laureata all’Università di Pisa con Marco Tangheroni nel 2000 e nel 2006 ha conseguito il dottorato di ricerca all’Università di Torino con una tesi realizzata in cotutela con l’Universitat de Barcelona, diretta da Renato Bordone e Antoni Riera Melis. Dal 2007 è inoltre allieva della Scuola Superiore di Studi Storici di San Marino sotto la direzione di Anthony Molho. Studiosa della civiltà mediterranea bassomedievale, si interessa da una parte di aspetti economici, sociali e politici nell’ambito delle relazioni fra Toscana, Sardegna e Corona d’Aragona dedicandosi alla ricostruzione dei profili delle famiglie, delle reti e delle presenze mercantili all’estero, dall’altra dell’organizzazione economica, del commercio e della comunicazione interculturale a Rodi nel Quattrocento. Since the publication in 1949 of Fernand Braudel's now classic at work "La Méditerranée et le monde Méditerranéen à l'époque de Philippe II", scholars have devoted particular attention to the Mediterranean as a historical subject, and have contributed to our understanding of the civilisations which emerged around the Mediterranean basin and the interactions between them. These groups were characterised by a high degree of mobility, particularly among merchants, who were the key players in the region's economic and cultural exchanges. In the Late Middle Ages, Tuscan merchants were among the most dynamic and entrepreneurial. Present with their companies in the biggest commercial centres of Europe and the Mediterranean, they were characterised by their broad diversification of investments, but above all, by their financial skills, which led them to play the role of bankers, treasurers and minters of coinage for princes, kings and popes. 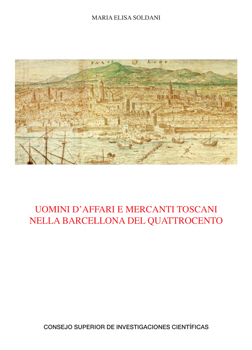 Within this tradition of research into Mediterranean urban history and the circulation of the elite, this book is dedicated to the study of the presence of Florentines, Pisans and Lucchesi in Barcelona during the Quattrocento. Barcelona was a commercial centre in which businessman from the companies that were the key players in international trade operated; these were individuals characterised by narrow professional specialisation and a strong legacy of political culture. The analysis of the rich unpublished documentation and application of proposopraphic techniques allow a detailed view of their business, means of social insertion, wealth-management strategies, conflicts and connections with power, in a constant dialectic between the behaviour of the group and individual careers, between prosopography and biography of the individuals who are an excellent expression of the complexity of the phenomenon. This book was added to our online catalog on Wednesday 21 September, 2011.